road later this spring to promote the values of growing your own. gardeners to make the most of home produce. under glass by those who do not have space for a greenhouse. beds from large pots, troughs and hanging baskets. the garden industry charity which creates gardens at children’s hospices. in Ditchling, West Sussex on May 13th. and support retailers in this increasingly popular market sector. labelled with Pippa’s ‘grow your own’ branding. – something that everyone knows I am passionate about. Christchurch, Dorset BH23 4SA. Tel 01425 272244. North Somerset BS49 5AA. Tel: 01934 875700. CB22 5JT. Tel 01223 842777. Lancashire PR3 0BT. Tel 01995 642900. Cheshire CH64 8TF. Tel 0151 336 2116. Worcestershire WR9 0DG. Tel 01527 860000. West Sussex, BN6 8TP. Tel 01273 846844. I’m pretty certain if you like growing vegetables then you like eating them too! * Offer expires 10pm 2/2/2012. Not valid in conjunction with any other offer excluding price discounts. No cash alternative. Offer may be withdrawn at any time. We reserve the right to refuse or restrict orders. Subject to availability. Dobbies have some great wellington boots here from Hunters. Treat your feet! First Launched upon an unsuspecting public in 1956 the original Hunter broke all the established rules, Lightweight, Neatly fitting and above all, comfortable. 50 years on and the original Hunter has become a style classic and quite simply a symbol of British country life.. The original Wellington has the legendary Hunter fit and is created on an orthopedic last and incorporates a cushioned footbed to ensure all day comfort. It has an anti-bacterial lining and a unique latex dipped construction, making them strong but flexible.. Every Hunter boot is made by hand, using a combination of modern technology and traditional craft techniques. The rubber used is an entirely natural product, tapped from rubber trees in tropical plantations..
Dobbies have this great book aimed just at bedding plants to allow to find out everything you need to know. Selection of hanging basket liners at Dobbies. Reuse baskets year after year with new liners. Tom Chambers Multi ‘Cut To Fit’ Liners – Versatile, cut to fit liner – Available in 2 sizes – Backed with polypropylene to retain water. MUL01 – small 75cm (29in) x 70cm (27in). MUL02 – large 125cm (49in) x 61cm (24in). Dobbies have these hanging baskets that are easy to fill. The liners are easy to cut holes in to put plants through. Wrap delicate plants in a piece of plastic before squeezing them through holes in liners. and hand-welded to produce a superb, long lasting product.. Quality liner included.. Question – Can you compost hair? Answer: Yes you can put human and pet hair on your compost heap. It’ll break down if it’s not stolen by the birds for nest material first! Some seeds need a nice warm temperature to get them started. This is where a heated propagator comes in handy! Ideal for propagating seeds and cuttings all year round, with the capacity to hold 8 full size seed trays. Strong, sturdy frame with a thermostatically controlled heated mat and sensor. 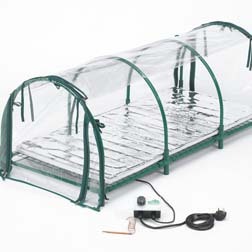 Easy to assemble.End panels can be unzipped to provide ventilation and the heated mat can be rolled up for easy storage. Thermostat can rise to 40 degrees and in increments of 8.Dimensions: 130cm x 60cm x 50cm).2 year guarantee. Loooking to buy seed trays to start off plants? Fantastic items available now at Thompson & Morgan. Leeks, sprouts, tomatoes and peppers can all get started in modules and seed trays. You can buy smaller ones which are ok for leeks and other plants. Bear in mind how long plants will be in them. Some plants like courgettes, melons, sweet peas, sweetcorn and marrow like being in a root trainer pot instead as it gives them a longer root system. 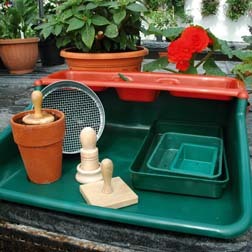 A practical tray ideal for keeping your greenhouse or potting shed tidy. High sided walls will hold plenty of composting whilst filling pots and trays for seed sowing or potting on.Also features a handy detachable shelf, to hold all those useful seed sowing and potting accessories.Dimensions: 61cm x 55cm x 20cm.Bench Tidy contents not included. behind what was by then a large market garden to live in France and Zambia. His gardening methods sound interesting! I love the idea of not digging even clay! The key to his no dig method? The initial action of mulching with thick layers of cardboard, compost and manure in the first year leads to a massive boost in long term fertility and results in remarkably little weed growth. Subsequent years see much less time and compost needed, while soil continues to improve under dressings of one to two inches compost or well rotted manure.